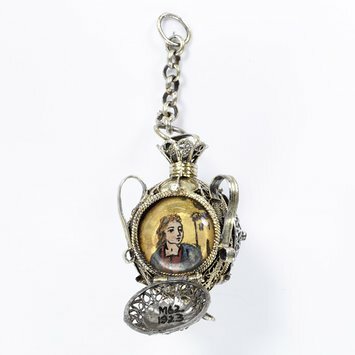 Religious medallions and other pendants, often mounted in decorative filigree frames, were widely worn in Catholic Spain. They were often acquired as souvenirs at the numerous pilgrimage sites, and were used as amulets against all the dangers of daily life as much as aids to prayer. This vase opens on three sides to disclose religious paintings of St Barbara, St Anthony of Padua, and the image of the Christ of Jaen, surrounded by the instruments of the passion. Pendant in the form of a three-sided vase, decorated with filigree, hanging from a short length of chain. The vase has three loop handles, between which are three circular hinged filigree covers, which open to show pictures of St. Barbara, St. Anthony of Padua, and the Instruments of the Passion (The vernicle, or veil of Veronica, as venerated at Jaen) reverse painted on glass on a gold ground. Vase-shaped silver filigree pendant enclosing three religious paintings, Spain, 1800-1890.